RV Tire Safety: Does tire pressure follow the "Gas Law" ? OK kids, today's science lesson is about the stuff we inflate our tires with. If you don't want to take the lesson simply skip to the "Bottom Line." If you took engineering, chemistry or perhaps some other science class in school, you might remember something called the "Ideal Gas Law" PV=NRT. I covered the formula in THIS post, and the resultant "Rule of Thumb" is that for every 10°F increase or decrease in temperature the pressure in your tires will increase or decrease by 2% . Now we need to be careful and remember that some may be discussing passenger tires where 2% of 36 psi is rounded to mean 1 psi change for 10°F change but I am discussing tire pressures that may range from 45 psi to 130 psi so percentage is more accurate. But that formula is based on basic scientific theory of a dry gas used in a non-expandable container. The first "fly in the ointment" is that most people are inflating their tires with compressed air and air is a combination of different gases such as 78.084% Nitrogen, 20.946% Oxygen, 0.934% Argon 0.03769% other gases such as CO2 , Neon, Helium, Methane, Krypton, and Hydrogen. Note the concentrations of these trace gases along with various "pollution" changes over time so the specific percent varies slightly. Wikipedia has the details if you are interested. The other major variable is the percent moisture. Water vapor varies between 1% and 5% depending on temperature and geographic location. It also varies based on the process of compressing air and the quality of maintenance the air compressor receives. In general the percent of water vapor will be raised in an air compressor, so unless special procedures are taken you are going to end up with a few percentage points of water vapor. Making this even more complex is that the effect of moisture on your tire pressure varies with temperature. This can range from less than 1 psi to almost 5 psi. I have a post on how you can make the air you use to inflate your tires "dryer" if you feel that is important. In the equation the V stands for volume and since tires do expand a little bit as the pressure goes up and inflation gas isn't 100% dry or 100% of any one gas but a mixture of Oxygen, Nitrogen and other trace gases, these facts have an effect on how close to PV=NRT you will get with your tires. Remember that even if you pay to "fill" your tires with Nitrogen you will never reach 100% nitrogen as there are always some other gases mixed in. In some experiments I have seen that the best you can reasonably expect to get would be about 95 to 98% N2. Another problem is to know the actual temperature of the gas inside your tire. Most people have either an external TPM sensor or use an IR gun to measure the temperature of the tire and mistakenly assume that is the temperature of the gas inside the tire. 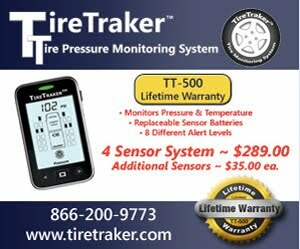 About the only time you might obtain an accurate reading of tire inflation air temperature is many hours after last moving the tire and hours of storage in a constant temperature room so both in internal and external temperature is the same. In an effort to get closer to the actual numbers I decided to try and do a quick experiment using an internal TPMS and an External TPMS on my Class-C motorhome. I ran into a number of problems. Some of these problems include the fact that external sensors did not completely "wake up" in the first minute of operation so I was not able to easily get a zero point temperature reading. Also we need to accept that despite claims to the contrary, TPM sensors are not calibrated laboratory grade instruments so they introduce some error into the experiment. Next we need to consider that external sensors are only providing the temperature of the metal in the sensor body which is affected by the outside air temperature. This will usually result in a cooler temperature reading than the actual temperature of the gas inside the tire. I did collect some data but with all the variation I was able to identify I felt the experiment did not deliver any meaningful data. I did see variations in pressure readings between the internal and external sensors over time but the numbers were inconsistent. 2. Tire inflation pressure does vary with tire temperature and the pressure does increase as the temperature increases. 3. Dryer inflation gas will have less variation of pressure than "wet" inflation gas. 4. In my opinion none of the above observations is significant enough to change the "Rule of thumb" that we can expect our tire pressure to vary by about 2% for every change of 10°F. 6. Best advice I can give is not to get your shorts in a bunch about inflation. My takeaway from all this is, check your tire pressure before you head off. Make sure they're at the recommended pressure, and enjoy your drive. PV=nRT is not the applicable equation here, because it does not compare two conditions of pressure and temperature. Gay-Lussac's law, P1/T1 = P2/T2 is what you need. The pressure/temp relationship is completely independent of the type of gas, including water vapor. The only complicating issue is when you go below the dew point, and some of the water vapor condenses out, but even then the change in pressure is minute. Your comment is technically correct. However I was simply trying to presnt the reason for pressure to change when the temperature changes and to provide an approximate level of the change.